Ebbles Miniatures has released their latest paper terrain. Frontier farmstead set. Includes dome habitats, greenhouses, utility sheds, water generators, water tanks, solar generators, wind turbines, and water towers, allowing you to build wind farms, water farms, solar farms, and more. I’m a big fan of Ebbles Miniatures and Mel has certainly shown that his talents have no bounds. 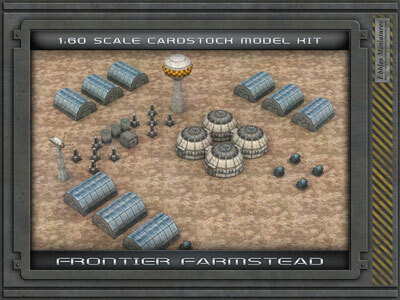 The Frontier Farmstead is a brilliant set for any of your sci-fi wargames or roleplaying games. In particular the popular Star Wars , HALO, or Starship Troopers . Personally I’m going to kit bash these by scaling them down to 10mm size for Mech Warrior Age of Destruction. The textures are some of the best Ebbles Miniatures has produced so far, very impressive. The builds and designs are refreshing and imaginative. The choice of colors will be easy on your ink cartridges.